3-piece set includes 8-inch melamine plate, 5.5-inch melamine bowl, plus 10 oz plastic tumbler. 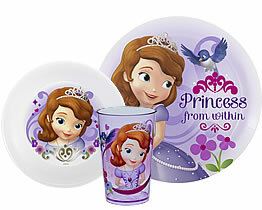 Great for Sofia the First fans. Purchase the coordinating flatware together with the plate set and save 15% off the regular flatware price. Choose the "with flatware" option to get this special price.